Subterranean termites are extremely destructive. The first step is building tunnels to wooden structures. This allows them to burrow into the structures to obtain food. Any wood or cellulose-containing material is a food source for the colonies. Given enough time, they’ll eat until nothing is left but a shell. Termites avoid light and air, so they build their colonies where you’re not likely to stumble upon them. Termites are the major wood-destroying structural pests in the southern United States. According to some estimates, over $2 billion are spent annually in the U.S. controlling or preventing termite infestations. In Arkansas, our main problem is with subterranean termites. Termites are “social insects“, i.e., they live in a nest or colony which is typically found underground, often near a tree, stump, wood pile or other source of ‘food’. Each colony contains a king and queen who are brown in color. The queen is able to lay thousands of eggs each year. 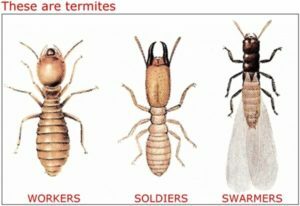 There are also soldier termites which have large heads equipped with large mandibles (“jaws”). The soldiers protect the colony from invaders (such as ants). The majority of the colony consists of thousands of whitish workers who have various jobs within the colony. Some workers take care of the queen and the newly hatching immatures (sometimes called “larvae”). Other workers forage for food. The foraging workers are the ones that we find infesting wood. As the colony grows, the workers expand the nest and their feeding area. A mature colony will contain 200,000 to 2,000,000 workers, although many colonies contain as few as 50,000-60,000. Studies have also shown that termites from a single colony may forage across an area of one-third acre and travel over 200 feet from their nest. One acre of land may support several termite colonies (although this doesn’t mean that all of them are invading your home!). A large termite colony does not usually occupy a single underground nest. As the foraging area expands the colony actually splits to form several smaller “nesting sites”. A termite colony matures in 3-5 years and begins to produce swarmer’s (winged adults). In Arkansas, our swarm season normally starts in early March or when temperatures reach 70. Swarming usually occurs during the day, particularly on warm days following rain. Swarmers found outdoors near tree stumps, landscape timbers, etc., are not an indication that your house is infested, but they serve as a reminder that termites live around us. When swarming occurs indoors, it usually means that you have an infestation somewhere within your house. Several species of ants also swarm at the same times of the year as termites. Winged termites and ants look somewhat similar, but you can tell them apart by certain features. 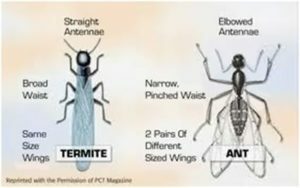 If you’re not sure whether you have termites or ants, show them to a pest control professional or bring specimens to your county Cooperative Extension Center for identification. On the off chance you see them; termites and ants look very similar. Luckily, there are a few distinguishing characteristics. Your termite technician can show you numerous ways to keep termites from disrupting your home. Seal cracks and crevices where termites can get into your home. Get rid of newspapers, papers, bags, cardboard boxes, etc. If your home is on a crawl space, keep wood, cardboard, and storage, at least 8″ above the ground.